Nowadays, everybody has heard of the importance of employee feedback. It’s a basic need for every work team. When you know what others are doing and feeling, you feel more engaged in your workplace. Continuous work feedback helps you build stronger teams and it helps reducing employee turnover, which is a major concern for every organization. Managers need to pay more attention to their employee’s feedback, the questions now are how and why. Feedback is an easy concept to understand at first. It’s sharing your reactions and opinions about something that happened before. Applying that to the workplace environment may be a little bit more complicated. The hard part is to understand what is implied in each feedback. Other questions start to pile up when addressing this topic. What kind of feedback should you be looking for? How can you use that information to help you reach your goals? Is there good and bad feedback? How can I get honest feedback? There are a lot of important questions you should ask about feedback because it’s a very complex topic when you really dive in. We tried to address the main concerns when referring to employee feedback, so that we could provide to you a insightful approach to this topic, answering the main questions. What is employee feedback and why is it important? You can define employee feedback as sharing constructive insights about the workplace environment to your peers or higher-ups. It can and should come from every level of the organization. It’s the gathering of all that information from different perspectives that makes employee feedback so valuable. Feedback is a reaction in its nature. It generates from what happens around you and at the same time you start to build an opinion about that. In any organization, feedback is essencial in order for everyone to be productive and reach their potential. You need to remind yourself of why you are giving or asking for feedback. It should have a clear goal behind it. But in seemingly every case, feedback has one clear purpose: it’s the beginning of a conversation. It starts a dialogue about something that needs reinforcement, either to improve or compliment. Feedback helps you maintain positive behaviors and correct bad ones. It should be helpful in understanding how everybody’s actions are reflecting in the company’s productivity. Employee feedback is crucial for growth in the workplace environment. It serves as a very important tool in making sure everybody in the organization improves on their work. Feedback can be either positive or negative, but it should be accurate in assessing everybody’s performance. Positive feedback is complementing someone’s impact on the workflow of the company. It can be very valuable as it validates someone’s efforts and results. Everybody wants to feel recognized by their efforts at work, so positive feedback can be a great tool to motivate employees and improve overall workplace morale. Negative feedback implies a need for change, something that needs improvement. It means that there is a situation that needs addressing, normally to correct it. Even though it refers to something negative, it should be embraced with a positive attitude, like all feedback. In fact, more employees consider negative feedback as more useful because it helps them grow by point at what they need to improve. Both positive and negative feedback are extremely helpful in maintaining a good workplace environment. They make you aware of what needs attention in your organization. Employees will also be aware of their impact in that same organization and what do they need to do next. Either being keeping up with the good work or improving some work behaviors. Good feedback will help them feel more engaged and motivated. What is good and bad feedback? You should always strive to give good and accurate feedback. That kind of feedback allows you to grow and improve your overall performance and behavior in the workplace environment. A good feedback culture is crucial for constant employee satisfaction, and therefore engagement. Bad feedback can be your worst enemy in that. It can leave you unsure of what you can do to improve, leading to a lack of engagement and career direction. So what really sets good and bad feedback apart? How can feedback be good? In order for feedback to be good and useful it should have a series of attributes. Feedback should be honest, straight to the point, and reflect truthful information. The more sincere a insight is, the more value it will have. You should always look for honest takes on you and your work. It makes you reflect on where you can improve, a point you can focus. It should also be timely and continuous. You should be able to address feedback in the moment and strive for immediate improvement. Continuous honest feedback is a reliable source of workplace insights that will make you more aware of possible problems. Employee feedback serves as a starting point to a discussion about your workplace environment. You may have noticed that the three examples we gave you ended with questions you should propose to your employees in those situations. It is crucial for them to realize that feedback ultimately is a growing process. We all need to try to be better at what we do. So it is important you start a dialogue about work issues. How can feedback be bad? Knowing what good feedback must have, it is also easier to understand what you should avoid in feedback. That is what you can consider as bad feedback. In that sense, bad feedback is feedback that limits what you can retrieve from those insights. Sometimes it’s with good intentions but fails at delivering concise and effective information. When it misses those points, it’s feedback that doesn’t help in your growth. Feedback should always reflect a positive attitude, even when it’s negative. That way, problems could become opportunities to grow. If it doesn’t reflect that attitude it’s bad feedback. It ends up being criticism for the sake of criticism only. Bad feedback is, in general, feedback that fails to understand employee’s needs. In a growth mindset culture, that kind of feedback can be an obstacle that managers and employees alike need to go through. Always strive to give and ask for effective feedback as a way to prevent bad information to become a threat to employee engagement. What are the benefits of employee feedback? Sharing and gathering feedback brings several benefits to the workplace environment. You need to focus on the advantages that feedback can bring to your workforce and organization as a whole. So how can employee feedback help you? Understanding what you can give as a worker is one of the more important steps in career growth. You need to be aware of what you can offer and where you are so that you can plan what do you want to become and where you want to be. Feedback allows you to understand where you need to focus. This is a crucial tool for leaders because it provides them with the information they need to settle a path for their employees to grow. Most times, people don’t know what others feel about them. You may very well think others have a worse image about you than the image they actually have. You need to be aware of your own worth and impact to others and feedback is a great tool to do just that. Employee feedback helps you understand “how” things are done much more than “what” was done. That focus on the process instead of the outcome is vital to improving on what was missing from the first try. Everybody has certain goals that they need to achieve, but if something is missing you’re not going to find that out by evaluating what is left to do but instead how did you do it. Understanding what is missing in your workflow is a big part of why feedback is important. Little tweaks and improvements can always be implemented, and it all starts from a honest conversation about it. You can only improve through honest conversations and that is the first step you need to take. So candid feedback helps build rich dialogue between you and your peers. By highlighting your strengths and weaknesses you are able to grow through that conversation and value the continuous aspect of feedback. The more frequent it is, the more workplace conversations are valued. That open dialogue helps you build better work relationships, that can therefore help you improve. Relationships are built on trust from that dialogue. Sharing feedback is a mutual beneficial exchange as it allows both sides of that exchange to support each other. So that dialogue helps build stronger bonds between employees. Personal growth is a basic career need, we like to feel we are improving everyday. Continuous employee feedback is the perfect tool to help in that need. It gives you a constant stream of insights you can use to develop new skills or improve certain behaviors. An honest opinion about you helps you understand where you need to go and what do you need to be. By providing opportunities to grow, your workplace will be more enticing for employees to stay there long term. A good feedback culture helps in making your company a great place for people to grow their careers. It starts by implementing continuous feedback in order for you to be aware of your own performance. When you know where you made mistakes you can assume your own responsibility for that and improve. That accountability is vital for overall company performance. You need to acknowledge your own impact so that you can determine the best plan of action. If everybody takes responsibility for their own actions, then it’s easier for everybody else to perform according to their own expectations. Sharing feedback helps in maintaining an even field for anyone to take that responsibility. You become aware of your employees struggles and you can help them with those problems. It also helps employees perform better as they have a clear path to go through. What is feedfoward and why is it important? When we defined feedback, we said that it was something that happened, referring to the past. As we try to use feedback as a tool to improve, we have to think about the future. In that sense, we came to the concept of feedfoward, so what does it mean? That concept was first introduced by Peter W. Dowrick and it is a learning method through which you can determine the best path for the future. Feedfoward is different from feedback in the way that it focuses on improving for the future and not on trying to solve something that happened in the past. You should use feedfoward as the ultimate tool to improvement, as it is directly connected to potential growth. It’s valuing strengths and striving to improve those same strong points. It helps shape a better future based on your experience, the good and the bad. It’s better to correct past behaviors and make improvements than to just criticize employee’s mistakes. While feedback is sometimes seen as a personal attack, feedfoward strives on providing information that is useful for personal growth. It doesn’t depend of past experiences, you can provide feedfoward without prior personal information. Drives change in your workplace in a more positive manner. It promotes being “great” at something, not just settling for “good”. Builds solutions and opportunities for everyone in your company. It shares most of the same principles as feedback as it values honesty, specific insights, a timely scheduling and it leads always to follow up questions in order to discuss what you can do better. Therefore, feedfoward is feedback but driven to constant improvement and future development. It focuses solely on employee growth and providing new opportunities for that growth to expand to the entire company. How can feedback help your performance? Using feedback in order to improve is something we do in a day-to-day basis. We get insights about what we do and we interpret that information in a way that can help us in the future. Therefore, it can have a direct impact on your performance. You need to see where you failed or just needed a little improvement and work on it. That way you are evaluating your own impact and addressing what needs to change. It can inform you. Feedback can illustrate where you need to improve or what behavior is recommended for that situation. It helps you have a better understanding of workplace needs and evaluate the impact of your actions. It can motivate you. The emotional parte of feedback is also very important for you to feel more engaged in what you are doing. Feedback gives you other perspectives about your workplace and about yourself that you can use as motivation. Employee feedback, above all other things, values the potential of change and how that can improve your performance. The key principles were set on the previous topics, now is applying those guidelines to your everyday tasks. Self evaluation is vital for any worker to understand where they could perform better, so feedback will always be a crucial part of employee performance. What are performance reviews failing on? As worker needs keep getting more complex, the way you evaluate their performance should evolve as well. In that sense, traditional methods have failed to reflect actual change in satisfying workplace demands. Annual performance reviews are outdated in a sense that they no longer accurately reflect workplace conditions. One of the main problems is the lack of two dimensional feedback between employee and manager. Normally, all of the feedback gathered by annual performance reviews is only accessible by management level. They are often very formal so it doesn’t reflect an open conversation environment. That limits employee growth because they remain not aware of where they can improve and they cannot have a healthy discussion about workplace problems. There is also the problem that yearly data doesn’t accurately translate workplace dynamics. In a modern business, every week represents a whole new challenge, so limiting performance reviews to a year at a time can be an extremely biased analysis. Timely updates are needed in order to understand workplace dynamics. Employees want more from their workplace and from their leaders. They need a day to day level of recognition in order to feel more engaged in their work. They want to talk about their careers and feel like they are growing with each challenge they encounter. What is continuous feedback and why is it important? With a clear need of daily feedback to better assess employee performance, you need to implement a more day-to-day or even week-to-week approach to gathering feedback. Having consistent daily feedback is a very valuable tool for any workforce. Self improvement is something that you should strive to do everyday, so having daily feedback is key for that effort. In that way, continuous feedback is adopting methods and tools so that you can give and ask for feedback about yourself in a more frequent basis. It gains value when it’s more recurrent because it’s more accurate to the environment as it is evolving. Continuous feedback is fundamental for higher employee engagement. Continuous feedback can also provide a constant stream of information and open dialogue. That kind of openness can help make things more transparent to everyone in the workplace environment. It helps in maintaining everyone up to date with current company issues. The continuous nature of feedback is essencial in making the modern day employee more engaged in their workplace. As they are more demanding of their conditions and opportunities to grow, continuous feedback serves as a great tool to keep those employees happy and motivated. Feedback adapts to the needs of the people involved, so it’s important to always keep those needs as a priority. How to give employee feedback? Now that you understand clearly what good feedback is and why that is important, the main question now is how to give useful feedback? There are many strategies you can adopt. It should ultimately reflect how you see your employees and how do you want to help them grow. 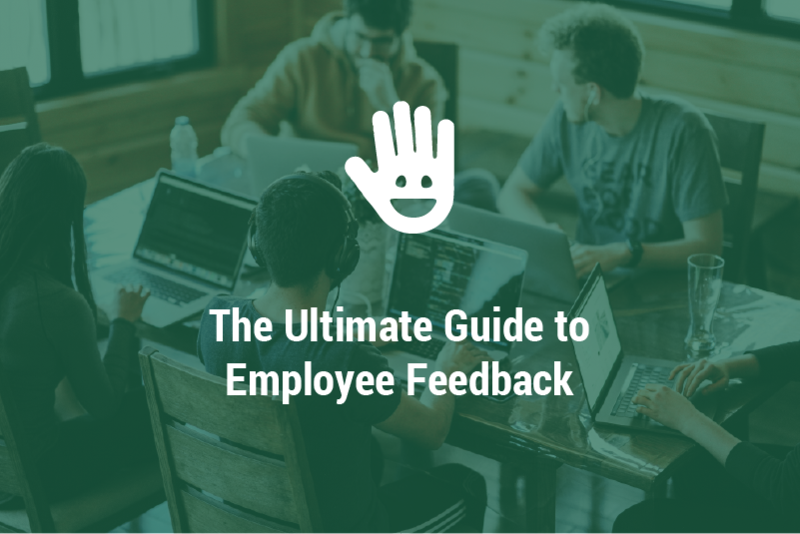 You should give employee feedback in a continuous basis as it was mentioned before, but also strive for provoking certain emotions in your workforce. Trust is a crucial one. A good feedback culture can build trust within your team. Give feedback that can help employees trust you and feel safe sharing work problems. You must act as things are happening, not after. This is why continuous feedback is that important. You should solve each situation as quickly as you can, so you must give feedback as soon as you can in order to recognize someone or solve some problem. As we discussed before, your employee’s needs are a priority to you. You need to be aware of what drives them and what is concerning them so that you can be a better leader. Therefore, give them feedback that helps their goals and objectives. It could be positive or negative feedback, but one is not more valuable then the other. You just need to certify that you get your point across with honest and precise insights. Have a clear message and go straight to what needs improvement. Be truthful to what do you stand for. Don’t wait too much time to share important information. Strive to make a positive change in your workplace. Approach people on how they are dealing with their struggles. Giving effective feedback is the goal for every manager. If you make sure your message gets across and you see results in your action, that validates your feedback culture. Seek to promote constant improvement to your employees through good, helpful and effective feedback. How to ask for employee feedback? You should give feedback every opportunity you have but also consider asking for feedback about yourself. It’s very important to understand what kind of impact you are having on your peers. They might have relevant insights on how you can improve, so you should always give them a chance to share those insights. How can you do just that? As a manager, you should seek for advice about your job. Trusting other people’s opinion helps them feel valued and validated for their insights. You should ask for that feedback when you have the chance and retrieve those insights as advice to you to do a better job. That last example showed how important asking feedback is for who asks and who gives, as it helps you and it validates other’s opinions. This is why you should ask for feedback in a more frequent basis. Making asking for advice and constructive insights a habit so that you can best utilize the opportunities feedback can give you. Talking about negative feedback is always a tricky situation. You don’t want to feel disappointed by your efforts and you want to keep yourself motivated. However, questioning negative feedback and making it easier for others to give you that kind of feedback is essencial because you need those insights in order to grow. Also try to vary with the feedback methods you apply. Sometimes a simple conversation is good for that situation. In other occasions, maybe a survey could be a better solution. Don’t create fatigue in your employees relating to the feedback you ask. Always make sure that they are up for sharing those insights. How to receive employee feedback? Don’t be defensive in your response. Be open to constructive criticism and embrace that you can always improve on your work. Don’t try to fight other’s opinions and realize they can be a positive influence for you. It’s valuable information for you. It’s important to be a good listener, but also make sure you understand what is being told to you. Seek for specific and candid information. That way you can determine the best way for you to act upon that feedback. If you have a complete understanding of the situation your judgement will be better in developing a solution. Receiving feedback is vital towards understanding the importance of employee feedback in your organization. You need to make sure that the feedback you gathered is important in planning your follow up response. You will only be able to improve through good feedback, and how you receive and understand it defines your next approach to employee feedback. How to reply to employee feedback? The follow up to feedback is important in giving value to that exchange and improving workplace conditions. You need to know how you should respond to certain insights. Some situations will demand more of you and others won’t. It’s up to you to determine the best course of action. We provide to you some examples of how you can handle some of these situations. This is a dangerous insight on someone that is feeling really bad about their current work situation. You need to approach him/her with caution and try to understand the situation before you set up a proper response. “What did others do that made you feel like this? When did you start feeling left out?”. As soon as you know what caused that feeling, you can think of a solution. “Have you tried talking to each one of them and understand what they are feeling? I think you should ask them for feedback about you”. By having a more nurturing approach you can start building trust between you and that employee. This is a clear positive feedback, and it also deserves a good response. First thing you should do is thanking that compliment and try to understand what behaviors are most responsible for that. “Thank you for your words. Where was I able to help you reaching those goals?”. Like in every feedback sharing, a follow up conversation is crucial. That way you can understand what needs reinforcement and deserves to be recognized. The example provided reflects a situation where your own well being was put to the question. If this happens, you need to address the feedback received with the up most honesty. In this case, tell a little about yourself, let other people know what you are feeling. “I have been through some personal issues, but I’m making strides in order to improve. I’m really sorry about the situation. Where can I be more of a helpful presence?”. This is a more approachable response to tough question. You will be put to the test sometimes and it’s important that you can be honest in handling these situations that require a balance between your personal life and your work performance. Employee feedback is important because it’s a gathering of different perspectives on the organization that provides constructive insights on the workplace environment. Feedback must have a clear purpose in order to help employees grow with it and to start a conversation about work issues. Both positive and negative feedback are important so that you can be aware of your strengths and weaknesses. Good feedback is built trough honest, timely and meaningful insights on your work performance. Bad feedback is limited in its analysis and it lacks a positive attitude for the future. Employee feedback brings you several benefits like self-awareness, addresses how you perform, it improves dialogue and relationships, it helps you grow and feel more accountable for your efforts. The concept of feedfoward is the idea of feedback driven towards building a path for the future. Employee feedback helps you perform better at your job because it informs you where you need to improve and it recognizes your efforts. Tradicional performance reviews are outdated because they don’t reflect the everyday changes of your workforce and your workplace environment. Feedback should be continuous because it helps you improve every day by providing you with precise information about your performance. When you give feedback you should focus on giving honest, timely and meaningful takes on your work environment so that it can be effective feedback. You should focus on asking useful advice to your employees in order to use that feedback to improve your performance in a more consistent way. Receive feedback as vital insights for your personal growth and helpful information to improve your workplace environment. Your reply to employee feedback should reflect your concern to help others and yourself to grow and build trustful relationships with your peers.